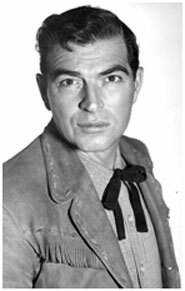 Stephen McNally had been an actor for eight years before he played his first western heavy. 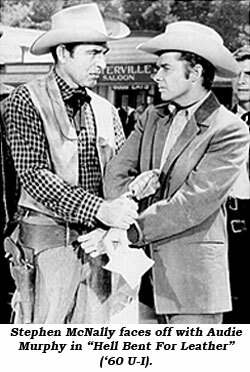 His role in “Winchester 73” in 1950 as James Stewart’s vicious, traitorous brother, Dutch Henry Brown, led to roles as either a heavy or a hero in 12 subsequent westerns in the ‘50s and ‘60s as well as guest star roles on some 16 TV westerns. Born Horace Vincent McNally July 29, 1913, in New York City, he had aspirations of being an attorney but gave up that career in the late ‘30s, switching gears to avidly pursue acting. He began, using his real name, on stage with “The Wookey” in ‘41 for 134 performances at the Plymouth Theatre. Arriving in Hollywood in ‘42 he continued to use Horace McNally in films such as “Grand Central Murder”, several “Crime Does Not Pay” MGM shorts, “Eyes In the Night”, and Laurel and Hardy’s “Air Raid Wardens”, among others. Changing his name to Stephen McNally he was notably despicable in “Johnny Belinda” (‘48), then came his star-maker villainous role in “Winchester 73”. 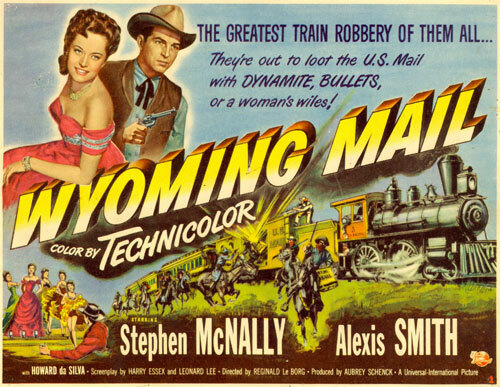 Signed to Universal-International his heroic side came through in “Wyoming Mail” (‘50), “Apache Drums” (‘51), “Duel at Silver Creek” (‘52) and “Stand at Apache River” (‘53). However, I always found his edgy, hard-eyed manner, deep, close-cropped speech pattern and demanding snarl belied an inner viciousness that made him perfect as a heavy in “Hell Bent for Leather” (‘60) opposite Audie Murphy, “Devil’s Canyon” (‘53) with Dale Robertson, “A Bullet Is Waiting” (‘54) with Rory Calhoun and “Requiem For a Gunfighter”, producer Alex Gordon’s all-star western in ‘65. Throughout the late ‘50s and into the ‘60s McNally worked heavily on television—guesting as an out and out heavy (or at best as misguided individuals) on “Wagon Train”, “Texan”, “Riverboat”, “Laramie”, “Zane Grey Theatre”, “Rawhide”, “Branded”, “Gunsmoke”, “Texas John Slaughter” and “Iron Horse”. In the ‘70s he primarily turned to working on cop shows such as “Ironside”, “Bold Ones”, “Mannix”, “F.B.I.”, “Rockford Files”, “Switch”, “Police Woman”, etc. For the ‘61-‘62 season he headed up his own crime drama as crusading newspaper reporter Paul Marino on “Target: The Corruptors”. At 67 McNally retired in 1980. Although his name never became as etched into the annuals of movie stardom as many of his contemporaries, in the long run he left us an interesting array of characters with little redeeming qualities. He died of heart failure in Beverly Hills, CA, June 4, 1994.